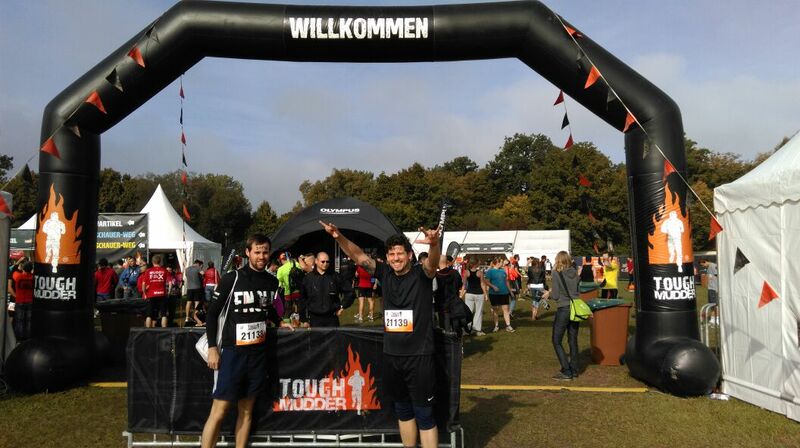 Finishing this event was my biggest physic challenge this year and it won’t be until the next weeks past till I am able to think about doing something like this again. In the end all of my training worked out well, otherwise I wouldn’t have accomplished this task. 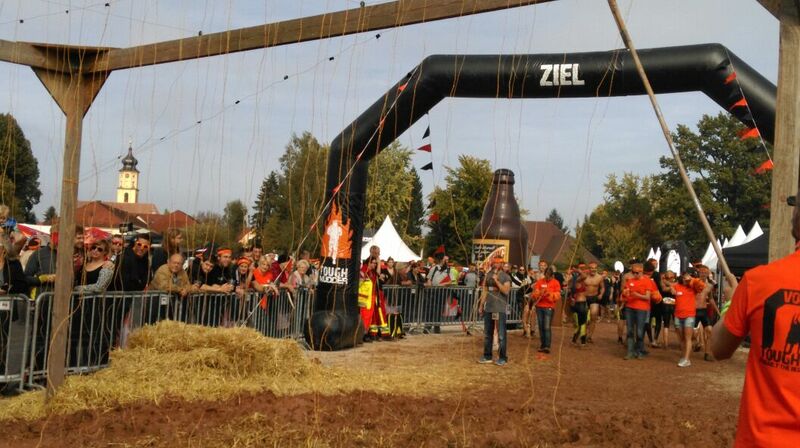 Here you’ll see an PDF for the track of Tough Mudder 2014 in Wassertrüding. 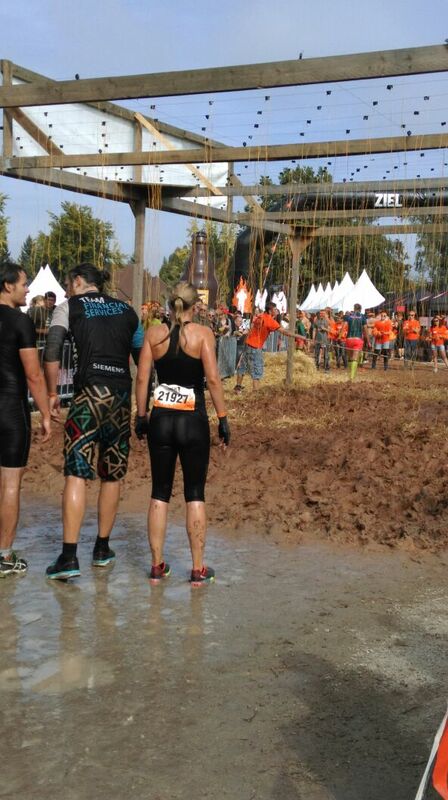 In short it’s been 18 Km, 23 obstacles, a great community and teamwork-spirit. 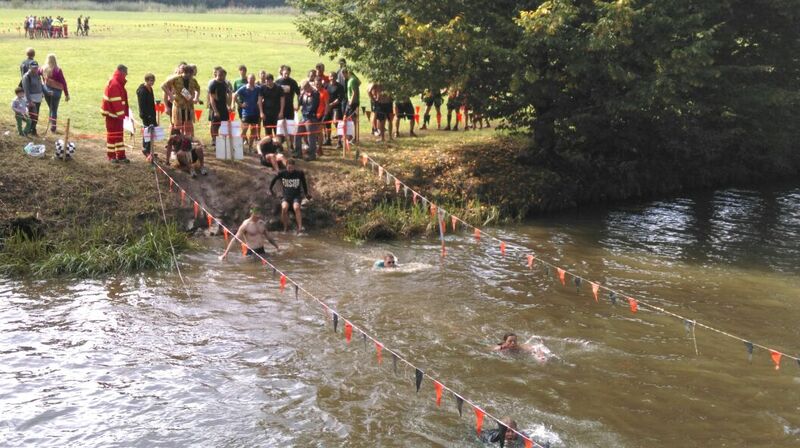 You can have a closer look at each obstacle on the Tough Mudder homepage. On my blog I’ll just talk about those that really challenged me both physical and psychical. 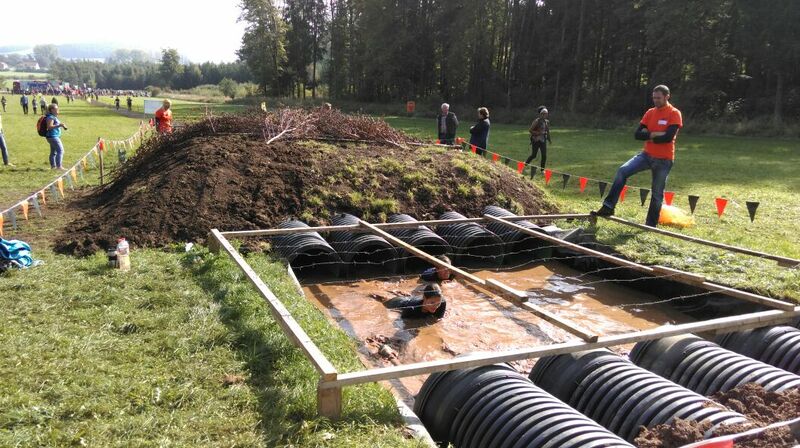 Best thing to do as I can tell is at the first obstacle when you have to go down on your knees crawling through mud with barbed wire hanging over your head is to welcome the mud. Take a deep breath and go all in, you won’t come through this without getting dirty anyway so just accept the feeling of cold dirtyness soaked up by your clothes. After that you don’t care about it anymore and concentrate on pushing onward. Even though this wasn’t me I think I sounded the same. I didn’t really expect it to be that cold. The assistants threw in blocks of ice every now and then. I slid in, slowly as I was told. Finding myself covered in ice cold water from toes to chest. Every sense was telling me to get the hell out of there immediately. 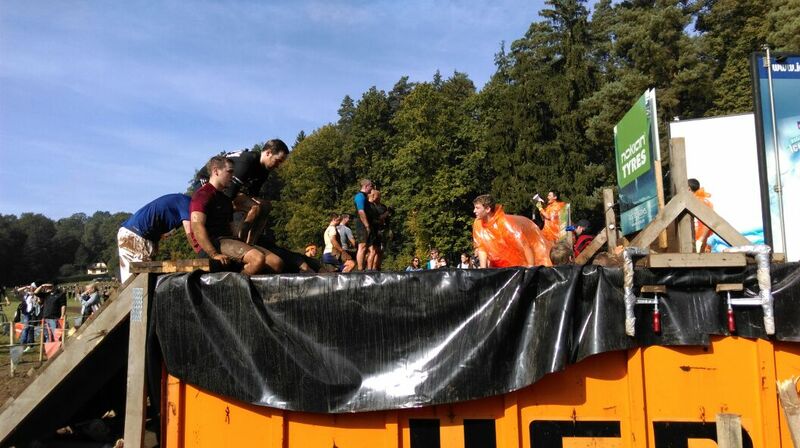 I fought my way halfway trough than had to dive under a wooden wall reaching somewhat 30 to 40 cm deep into the water. 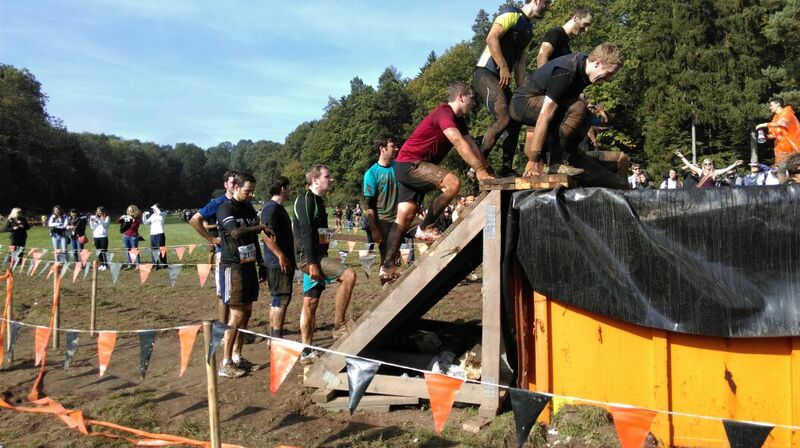 After that I was halway through and I could almost touch the plank that promised me relief from this agony. But I found myself surrounded by piles ice that got pushed to the edge. My body felt like it would collapse every second. 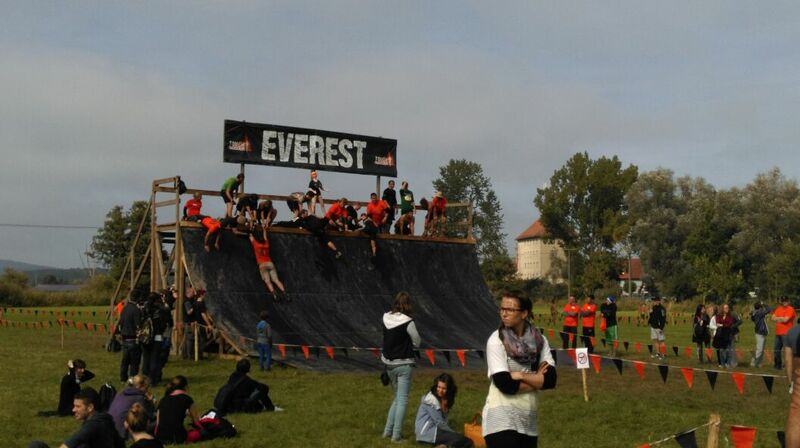 I can only remember the volunteer who assisted at that obstacle yelling at me to push myself further and keep on going. So I did. But it took a while till I had any feelings in my limbs again, espescially my private parts felt shock frosted quite a while. The other obstacle I found a lot harder than I expected it to be was the Cage Crawl. This was rather a test of psychological strength than anything else. It wasn’t hard to pull yourself along the tunnel floating in water. The water wasn’t even too cold due to warm weather conditions. But as I went down back first having only a few centimeters space between water and fence I recognized that this was tougher than imagined. I never was claustrophobic or afraid of water, my head just began to throw pictures at me beeing unable to breath or getting drowned from waves the peopla in front of me and after me were creating. It was quite a creepy feeling and I was really reliefed after I’ve been through it. 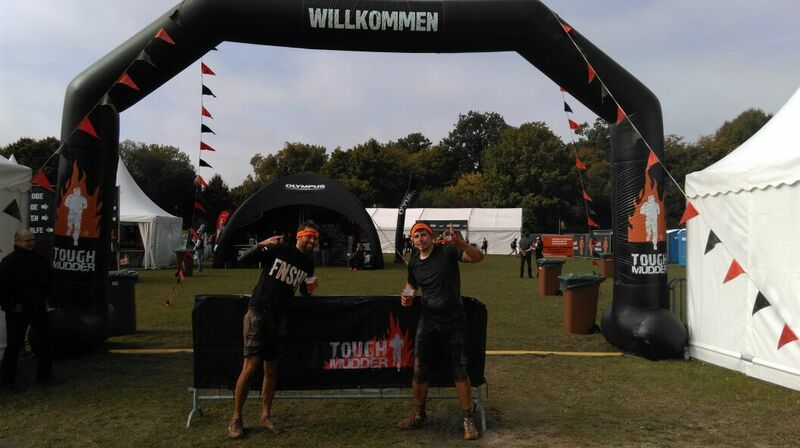 Just before the finishing line they set up the Electroshock Therapy. This one I also underestimated. I didn’t expect the shocks to be so hard, but unfortunately they were. 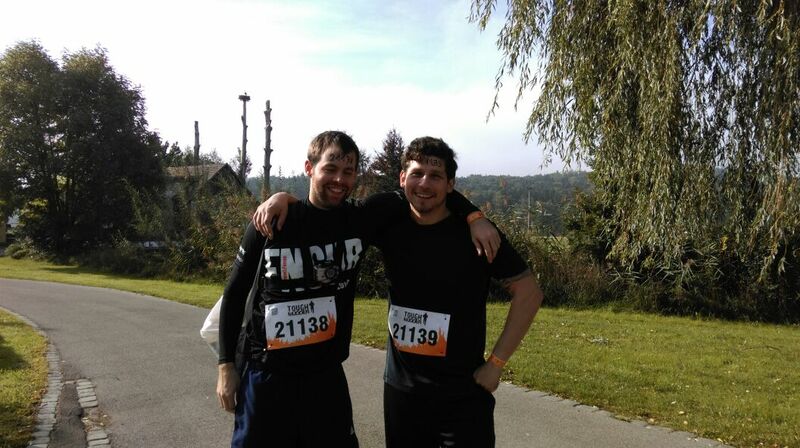 Me and my mate were running together the whole distance and as we reached the last obastacle and saw all the anxious people waiting in front of it we put all our courage and ran side a side into our doom. Yet whether I was slower or more unlucky I got hit many times more. My mate told me afterwards, he just got one hit short before the end so he made it and jumped to save harbour. Whilst I fell like I was hit by a gun as my muscles contracted in uncontrollable ways. I can’t remember if I was simply taken by suprise or if it really hit me that hard. I just wanted to stay down on the ground and get myself together. The strings were so long they reached me laying down there. So I got shocked multiple times and I reallized there won’t be no rescue, no peace until I made it to the other end. So I pushed myself for the last time this day over the boarders and I felt so happy the moment I passed the last strings that I fell to the muddy ground. I just made it. I am going to upload our own video soon, but the camera didn’t survive the Arctice Enema so we’ll have to see what we have recorded and if the material’s any good.